XLU outperformed the S&P 500 by almost 100bp in March. Declining interest rates and investor fears of an inverted yield curve provided nice tailwinds for the group. 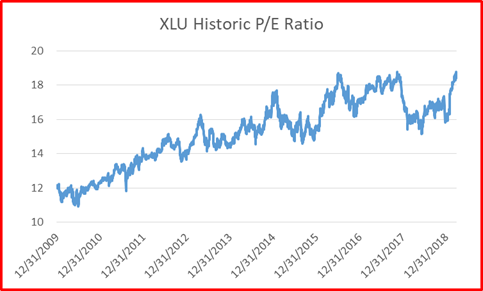 XLU and its P/E ratio are at record highs, so protection in a downturn may not be as much as expected. 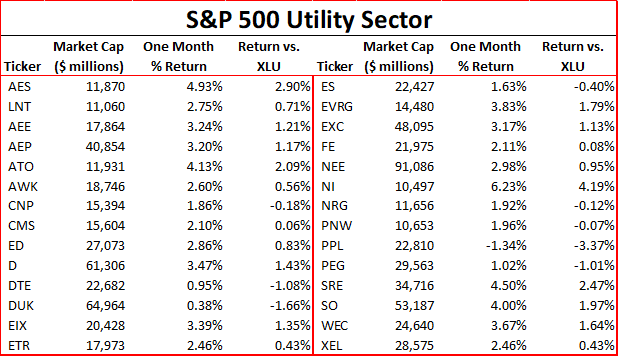 March was a decent month for the utility group, with the Utility Select Sector SPDR ETF (XLU) up 2.8%. This was the second straight month of outperforming the S&P 500, this time by nearly 100bp, but XLU still lags by about 280bp YTD. XLU was the fourth best-performing sector for the month, but is only the sixth best-performing sector YTD. Interest rates created a nice tailwind for utilities during March, as the yield on the 10-year Treasury fell by 29bp during the month. Utility stocks' "bond substitute" status usually means the sector performs well when rates go down. 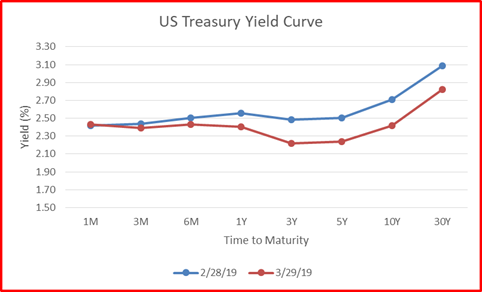 Part of the utility performance could be from significant inversion of the yield curve in March. Since an inverted yield curve has a good history of predicting economic downturns, people could be deciding to become more defensive in their investments and are shifting more assets to utilities. Further evidence of a defensive shift to utilities comes from the increase in XLU's AUM, reaching a record level of $9.3B during March. While it makes sense that investors would want to be invested in utilities during a downturn, caution is still needed. 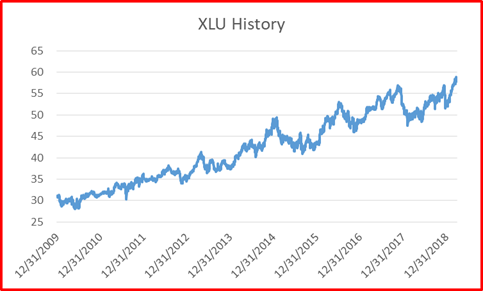 XLU has now reached its all-time high. This high has also been accompanied a P/E ratio at about all-time high levels. 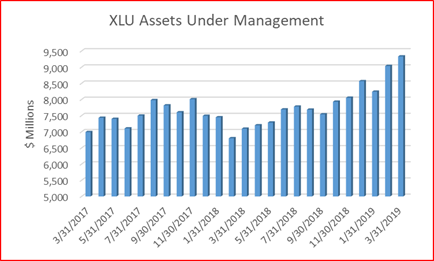 So if there is a downturn, XLU investors will still probably be happy they moved to utilities, but there is still risk of losses from multiple contraction. 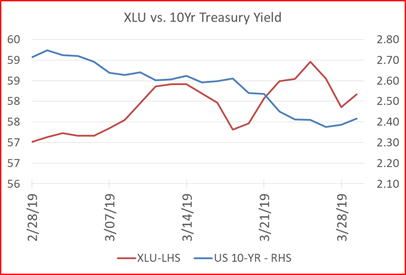 If the economy just meanders along, XLU investors are unlikely to benefit from further multiple expansion, and performance could be substantially behind the rest of the market. Performance in XLU was spread throughout the group, with PPL Corporation (PPL) being the only decliner for the month. The best explanation for PPL's decline really is uncertainty with Brexit. Over half of PPL's 2018 EBIT came from the UK. A hard Brexit could lead to a weaker British pound and a significantly lower value for this part of its business. Besides the Brexit issues, things were relatively positive for PPL, including a settlement agreement with most of the intervenors in a Kentucky rate case. This agreement would lead to a rate increase of over $80M. On the positive side, NiSource (NI) was the big winner, with a 6.2% gain, but there really wasn't a big driver for the gain. It has a few rate cases ongoing, where it is requesting increases totaling about $150M, but no decisions have come out of these yet. There was also no real news in the aftermath of its system explosions in Massachusetts last year as well. NI declared a dividend, but it was the same level as the previous quarter. Street earnings estimates also remained flat. NI's P/E went from 20.8x at the beginning of the month to 22x at the end, and the dividend yield went from 2.9% to 2.7%. It really seems like this is a case where people got more comfortable with the risks at the company and gradually bid up the stock price as interest rates declined. Sempra (SRE) was one of the other big up moves of the month, 4.5%, benefiting from the FERC approval for a new LNG terminal. At Sempra's March 27th investor day, the company also said that it is on track to start LNG exports from Cameron in the next quarter. March was a mixed bag for power prices across the country as winter started to wind down. Boston prices were about the same as February, but were higher compared to last year. Washington D.C. and PJM West power prices were about the same as February, but much lower than last year. Houston power prices were much higher than in February and looked higher still compared to last year. In California, power prices were dramatically lower than in February, but were about 25% higher than last year. We had close to normal weather across most of the country in March. However, when comparing to last year and to February, the weather was milder this time around. Texas was an interesting case for power prices during the month. 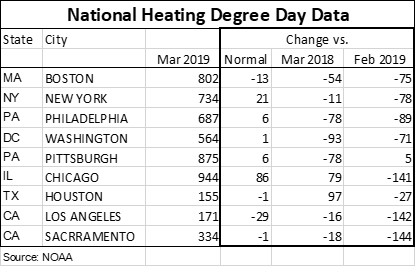 Early in the month, a cold weather front came across Texas, and the Texas operator ERCOT realized there was a chance for a record March peak. In March, generators start preparing to do maintenance projects since that is usually time for lower demand. 7,700MW of demand was scheduled to come offline on March 1 and 2, which was on top of 12,000MW that was already out for maintenance work. It turned out that ERCOT set a March demand record of over 60,000MW on the 5th. That day there were a couple of hours where prices really spiked, including one where they reached over $700/MWh. Obviously a day like that is going to bring up the averages for the month. (You can read some more about what was happening that day in Texas in an article from RTO Insider here). Exhibit 10 shows that the peak demand was almost 30% above ERCOT's peak of March of 2018. Part of the reason all of this maintenance is taking place in Texas is that ERCOT is worried about available capacity for the summer, and all generators want to make sure that their equipment is operating well when these peaks occur. On March 5, ERCOT put out a press release stating that it expects a historically low 7.4% reserve margin this summer (See here). Forward prices for August 2019 power were actually down slightly last month, but as you can see in Exhibit 11, they are still well above levels seen before 2018. Power markets in Texas also had to deal with the implications of low gas prices at the Waha hub that actually went negative a number of times. This means that people were paying others to take their gas away. This has occurred because of the tremendous growth in the Permian basin in west Texas as companies look for oil. When they find oil, the well also produces gas, and all of this associated gas is running into bottlenecks. In March, there was a disruption on a pipeline which tightened bottlenecks further and led to the negative prices. (You can read more about the negative gas prices here). So some electricity generators in Texas got paid to take fuel to burn to produce electricity for which they were also paid. In spite of this, electricity prices were still higher compared to February and last year, which really seems like a bullish sign for prices in the state. NRG Energy (NRG) and Vistra (VST) are two names that could really benefit if these summer high prices come to pass. Last month (see here) I discussed how natural gas price in the northwest were high and impacting power prices throughout the region. In early March, gas prices at the Sumas hub hit a new record, but electricity demand in California was much lower, so the gas price didn't have much of an impact on electricity. In fact, demand was low enough that the infamous "duck curve" reared its head again, and peak power prices in California were actually lower than off-peak prices during the month. As mentioned above, local natural gas issues can have a big impact on power prices, but the national picture for gas is still important as well. 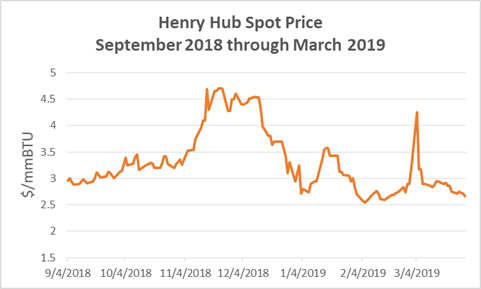 In March there was a short spike in gas prices at Henry Hub, but basically they remained well below $3 for the month. On February 28th, gas prices were at $2.89/mmbtu, and on March 31st, the spot price had fallen to $2.67/mmbtu. 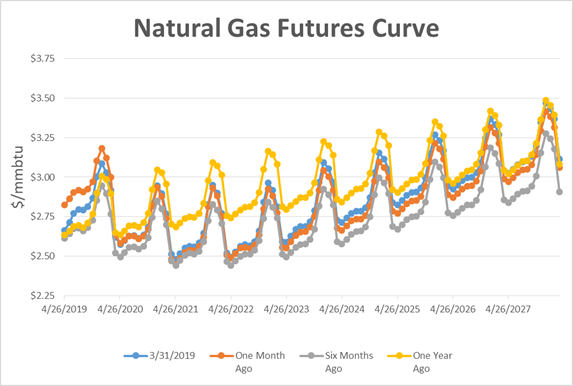 The natural gas futures curve shows that the market got much more bearish on 2019 natural gas during March. For 2020 and beyond futures prices stayed pretty stable. The low futures prices seem to say we've got plenty of natural gas and the market is trying to dissuade even more production. Disclosure: I am/we are long NRG, VST, SRE, PPL. I wrote this article myself, and it expresses my own opinions. I am not receiving compensation for it (other than from Seeking Alpha). I have no business relationship with any company whose stock is mentioned in this article.